Danny Krikorian is an Armenian-Syrian immigrant who came to the US at the age of 7. He is now 28. A DACA recipient, he is threatened by the new presidency’s announcement of DACA’s repeal. Upon this revelation, Danny K prepared and has released a short & sweet lyrical ballad – a traditional Hip-Hop record, lacing a looped-sample with charged lyricism. This one, is dedicated to all #DREAMers. It shouldn’t come as a surprise that white nationalism has triumphed in America. Brexit, the decision for England to leave the UK, laid the trajectory of the Western world earlier this year. The world is undergoing vast changes in response to economic decline and a rise in global terrorism, particularly from the Middle East. It has been 15 years since 9-11. The world is still in the post-911 era, in which economic insecurity and nationalism are rising together. The West, a fancy term which basically means Europe and America, is rejecting globalization and internationalism in favor of war-politics. Instead of allowing trade and diplomacy to bring nations together as the Obama Administration has been at least attempting to do and successfully in some cases – the US appears to have chosen the trajectory of its mother country, England – right-wing nationalism. The engine of the type of prosperity Americans yearn for is not one that can be offered by government. Ironically the right which is typically skeptical of big government has awarded itself the biggest government it could imagine – only one that benefits proponents of war. The left is painted as some conspiratorial elite meanwhile the right operates exactly as one. Many in the world are convinced that a Trump presidency is somehow going to be pacifist but they’ve forgotten – they’ve forgotten that if it weren’t for the GOP – Trump’s party – the world would be a much different place today. We might have never gone to war in the Middle East, spring-boarding the rise of ISIS and unprecedented waves in international terror. I do believe that the illusion which has been sold to the American people will be exposed. This is one giant lesson for humanity – that selective justice and moral relativism are dangerous devices to flirt with. Perhaps the West’s neglect for humanitarianism in the East has backfired. Hopes for living out the democratic dream in the underdeveloped world were hijacked and undermined. The hint of liberalism which crept in through the Arab Spring was eclipsed by a cold, harsh Arab Winter. In these next four years, the US is likely to engage in direct military confrontations – contrary to what Trump’s electorate believes they voted for. This is the basis of the GOP’s ideology. It is the engine of Anglo-Supremacy. Remember – Trump has no ideology. He just a hateful politician who exploits convenience. If the social scapegoat happened to be Japanese – he’d go after them too – and devise some sick conspiratorial ideology to advance it. In fact, Trump is not as detached from his party as it seems. There is a reason why he chose the Republican and not the Democratic ticket to run on this election, given he was formerly a member of the latter as is now widely known. The ideological battle in the GOP between nationalists and capitalists has given way to the former in the presidency. Rubio vs. Trump embody this difference. Trump is a sympathetic to dictators. Rubio is antithetical to them – partly because he is of Cuban ancestry, haunted by Castro’s legacy at home. The Cuban Lobby is one of the most powerful in America, and Cubans of the Latin-American community tend to be in the right side of the political spectrum, unlike most other Latin-Americans, such as Puerto Ricans, Colombians and so forth. The world is reeling from the election results and everyone is venting their frustrations and angers but nobody has really offered an accurate portrayal of what to expect. Ultimately, the party that brought Trump to power is the Republican base. These guys are conservative, and no matter what Trump’s rhetoric might have suggested, or what his own followers might want, the establishment of the conservative base which brought him to power is the one that dictates the future, similar to one the Democratic establishment which lays the agenda for their candidate. 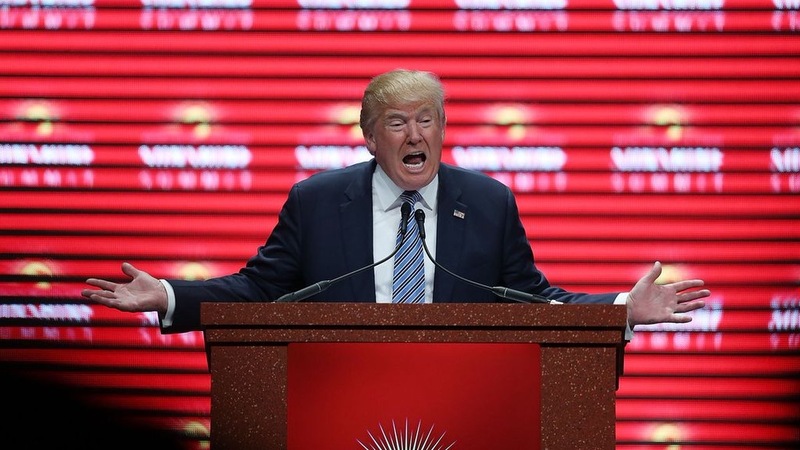 Donald Trump was portrayed as somebody who is maniacal, crazy, and a “masterful” politician. In reality, he was exploiting his privilege, inheritances, and political affiliations. The GOP knew that a Hillary-led America was their demise. What people do not seem to realize is the following – the specter of racism which is deeply embedded in American culture afflicts the world at large, and this can be true of nearly every political phenomenon which affects Americans. The US and the international arena are inextricably linked. The Russians played a part but the real reason for Trump’s win was the fascist racist subculture which largely dictates US policy in domestic and foreign spheres. The Russians have taken for granted Obama’s flexibility and compromise. Like the Americans, they feel they’ve encouraged the rise of a greater asset for stability – but what they underestimate, as they have their foes in their recent past, is Trump’s loyalty to his own party platform, whom without, he wouldn’t know what to do. This guy is a figurehead – not a policymaker. I predict Trump will be a disaster for both his nation, his allies and his foes – because he will act on the ideological positions of his party which will run counter to the reconciliatory efforts of Obama which eased global tensions, such as with Iran. He’s completely reduced US presence in Iraq. The exception was Libya. The Syrian Crisis can be blamed mainly on Gulf & Turkey. Trump will attempt to sabotage the Iran Nuclear Deal, inflame radicalism and terror & damage the global economy. His noninterventionism will prove to be a lie as the GOP convinces him to militarily confront Islamists more directly. He will embolden his Gulf allies, while supporting dictators like Assad, thereby creating a more dire situation of instability and violence – contrary to his empty promises of unconventional approaches to foreign policy. He will stand more strongly with Israel, and undermine Palestinian human rights therein – contrary to expectations that his competitor, Clinton would do worse. This doesn’t mention the domestic ills he will cause – and the backlash that will come with it. His empty promises will have proved to hijack the insecurities of Americans. They’ve created a new messiah for themselves. And almost every single accusation of deviousness levied by them, is in fact practiced by them in the fullest. The lazy, unambitious, privileged, complacent, unskilled, bitter, overweight, gluttonous, self-loathing, racist, dependent, nepotistic and unmerited class of Americans have shown their hypocrisy. They’ve shown that deep down they hate America; and wish to see it suffer as they do for their lack of conscience and humility. They echo radicals in their hatred of liberal freedoms which they are ungrateful for. Let us hope we can overcome. Whether that means enduring, impeaching, organizing or mobilizing. Trump will make a mockery of the Russians for believing he was better for them than Clinton. The GOP cannot decide between nationalism and capitalism – and the Middle East is a dire example of that where the US is caught between helping their Gulf allies fund ISIS & al Qaeda against Assad while simultaneously protecting Assad against ISIS. This double-dealing is symbolic of a long-lasting tradition called the Great Game, originally waged between England and Russia. Now the New Great Game is fought between USA & Russia, over regions like Middle East and Central Asia. Americans have amnesia. They’ve forgotten that the GOP is responsible for bringing us to the point we are at in our history. They’ve forgotten the Bush years. The WMD lies. The millions of dead Iraqis. They’ve forgotten the War on Terror. They’ve forgotten Obama’s inheritances. The media emblazoned Trump’s message everywhere and Americans naturally ate it up. Americans caved in. They could not contain their miseries. Meanwhile, the rest of the world has been reeling from American onslaught for decades. The point of this article is to demonstrate how the Republican Party has – once again – fooled Americans. You’ve all been duped into a new promise, instead of treading along the trajectory of realism and reconciliation as we were with Obama. All your conspiratorial messianic megalomaniacal invocations against Obama were actually embodied by your new GOP leader – Donald J. Hitler. If Clinton was a hawk – Trump will prove to be a bald eagle clutching a fasces. These next 4 to 8 years will be tough – but they will NOT be what people expect. I can assure you that by 2020, the world will be a much different place, and America will finally realize that, as leader of the world, still, one cannot practice democracy while expecting other nations to devolve into utter chaos, conflict and injustice. America cannot begin to be selective about justice at home or abroad. Only then can fascism be put to rest wholly. Trump’s election is a disgrace to America. It is a disgrace to the world and should be protested in every form. Whether we succeed or not in indicting him for ANYTHING he does we make it clear that this man is not liked, not representative, nor reflective of America as a whole. Trump endangers minorities, African-Americans, Hispanic-Americans, immigrants, Muslims, women & LGBT. Trump’s positions will reflect his own selfishness and that of those around him. He will even sidestep his own so-called beliefs and compromise them as long as it benefits the GOP’s vision of a racist and imperial America. All those who sympathize with him, particularly those from Arab or Armenian communities which I come from, will be made a mockery of when he displays exactly how he is going to undermine your community entirely. America will have elected a false messiah; and earned a devil instead. My worry is our ambivalence towards Clinton has put a much worse fascist in office. Trump is motivated by a complete lack of moral restraint. That is why I am puzzled by those who chose not to stand with Clinton, or who chose to devote their cause to a third party candidate, because of the clear racism and fascism harbored by Trump and his followers. But this is a part of the GOP fabric. The irony is that the GOP is both incompetent and bitter that even their own selfishness is without any achievement. How pathetic. Trump will side with Turkish fascism, racism (anti-Armenian, Kurd sentiment) & imperialism (involvement in Iraq & Syria). Somehow this will be reconciled with Trump’s promise to contain ISIS and ‘radical Islam’. They’ve pinned Hillary as a corroborator because of her “apparent shortcomings” but Trump’s double-dealings will prove to be actually devilish – beyond illusory YOUTUBE conspiracy theories. His team has already expressed an urgent need for closer ties with Turkey – despite democratic shortcomings and rampant ethnocentrism. He will side with Azerbaijani-occupation. He has already stood with Israeli-apartheid & occupation. As an Arab, there is no reasoning in siding with Trump either; or enabling him indirectly even. He hates Arabs; and Muslims. Trump will worsen the security conditions in the ME which will run counter to what ME governments think will b better US FP. He has already opened wounds by what he represents – the darkest shade of the American nationalist fabric. He will follow no consistent course of moralism – but rather a path of ambiguous yet vigorous authoritarianism. And he will violate every promise made of being noninterventionist justified as security initiatives as usual. Trump will renege every promise he’s made of being anti-establishment, non-interventionism and radical change. Instead he will drift the US along the course it was on before Obama – the one of Bush jr. You think otherwise because he’s claimed to be against this or that? Have you paid attention to his flip-flopping? Just remember – what the Russians expected out of their deal with Hitler was eventually overturned and they were backstabbed. It was convenient for the Germans at the time to lure Russia; just as Trump might have duped them into thinking he’s playing their game. The Democrats don’t need some cosmic change. We do want more minority representation but what defeated the left is fear. Just as fear defeated common sense when Bush beat Gore – who like Clinton won the popular vote. So much for being anti-establishment. We might have a chance to impeach Trump (for future or past unknown offenses; Treason w/ the Russians?) or force him to resign – if we have the willpower and legal capacity. Or we might have to endure and defeat him in the coming elections. It all depends on how things unfold and how far he goes along the spectrum of his maniacal, politically inexperienced imagination. If Trump deports people by the masses; passes laws that destroy the US economy; incites greater terrorism; expresses more authoritarianism; challenges US civil liberties; insults minorities – I foresee mass protests and unrest. Till then, we endure. A message to the younger generation is to remain more vigorous, organized and effective – and be universally cognizant of moral injustices around the world. This will empower us on the domestic and international level. Most importantly however it is time to exhibit some more confidence, similar to that of the FDRs, JFKs and even Obama. Let us harbor our humility and modesty; while exploiting our cunning. This is politics – not philosophy class – after all. Harden your skin, folks! Nazism, anti-semitism, racism & all forms of conspiratorial genocide denial are ILLEGAL in Germany and many parts of Europe. America hasn’t caught on because it benefits from the Anglo-American, White Supremacist Authoritarian Insecurity Complex. As Edward Said might call it, Orientalism or post-Colonialism. The violation of the Hatch Act by James Comey should have disqualified Trump – and his close ties with Comey and his associates, as well as those with Russia, should be grounds for disqualification. This isn’t necessarily to prevent a Republican victory, but rather, a Donald Trump victory. A Marco Rubio presidency, though controversial, would not elicit backlash because Rubio has never expressed Nazi ideals. Watch as Trump backtracks completely on all his anti-establishment policies and watch as he solidifies the American corporate grip on politics. Finally, you’ll see an unprecedented escalation is US militarism. All contrary to his empty promises, but consistent with his, and his party’s own neofascist foundation. The problem good people have is they misunderstand both politics and spirituality. They’ve got this extreme inclination, one that is imbalanced. The ordinary American seems caught between his materialistic desires and philosophical pretentiousness, without any middle ground. Politics is approached as some revenge game, not with any sense of practicality and moral imperative – the two contradictory ideological foundations of American politics. President Obama, Reagan, Bush Sr., Carter, JFK, FDR, Teddy, were among these types. But really guys? Enough with the privileged talk about third party candidates. Suspend your egos for just one moment. You guys fear some conspiratorial presidency under Clinton only to usher in an actually conspiratorial presidency under Trump as a solution or an alternative? What hypocrisy! And all this post-election banter about “listening to rural white America”. The same guys who have been telling us for years not to look at government as our savior have now idolized worshipped and ushered in their fascist messiah. Most of these guys are envious, unemployed, insecure, lazy, racist, sexist, selfish citizens who do not contribute to society economically or socially or politically yet blame immigrants for their own miseries, as opposed to their own egos and incompetencies. The irony – the privileged complaining about oppression. The fascists demanding government interference. The irony. The libertarians and the anarchists all who rallied behind a neoconservative symbol of tyranny. The Arab-Americans who sympathized with Trump – I hope Trump moves the embassy to Jerusalem in Israel so that you may be shamed for your support for him. The Armenians who doubted Hillary – you will feel shame for not recognizing your own selfishness in the face of a blatant racist. America will regret this decision. I find solace in the fact that Clinton won the popular vote. It furthermore underscores the establishment’s endorsement and enabling of Trump – from corporations, to hedge-funds, to mass-media – this is Trump’s syndicate which propelled him to the presidency. Trump has exploited controversy capitalism. What this means is he uses his position to get more attention through controversy instead of through genuine accord. Unlike previous presidents – especially those on the left – he lacks the educational, moral and character capacity and knowledge about policy to draw genuine support so he depends on appeals to the lower bases of human nature – such as attachment, idolatry & scapegoating. The mob rule mentality and controversy capitalism have overtaken America. A history of property laws based on preventing non-white ethnic groups from equal opportunity in the political and economic spheres thereby rendering them weak in representative power. Even Armenians were not allowed Racism has taken a new form in modern America. I am an Armenian. I know this all too well. I have etched images and movies in my mind – like figments of my imagination running through my blood and my genes – perhaps self-constructed – but nnetheless vivid and real – that recall of the horror and tragedy of the Armenian Genocide – I hear women’s and children’s screams. And Putin’s Russian has already expressed doubts about what Trump is promising he will do as a means of cooperating in Syria with the Russian army. Remember – at first before WWII both the Russians (then the USSR) and the British appeased Hitler – partly out of skepticism, but also because they kind of identified with him. They could “use” him. Of course it got out of hand, as most might predict, and led to one of the worst tragedies in human history. Hitler backstabbed the Russians – invaded them. Then he made the British regretful of their appeasement – by almost sacking London. What is repulsive is that what Trump is doing is not illegal. The right has nothing left to offer which is coherent to the American people and in fact the right is responsible for our economic turmoil as well as our militaristic endeavors. Without the right, there would be no Middle Eastern debacle – at least to the intensity it has reached. Trump has exploited miserable white men in need of a political messiah. What happened to self-dependence and working hard – values the right championed? Perhaps they weren’t able to achieve these themselves. And yet, they wish to disenfranchise minorities from the opportunity to compete – what insecurity! And so I guess we are flirting with fascism after all. Time will tell, but pay close attention. Trump will falter. There are so many opportunities I, and many like me, were denied due to institutional obstacles for immigrants, even one like me, who has lived in the US since he was 6. That was in 1996. It’s now 2016, and I’m 28. I still have no status anywhere except Syria, my home country, which for the most part, has been ravaged by yet another global war. My story begins in Riyadh. I was born there because like most Arab expatriates, my father found work in Saudi. I am of the so-called generation from Riyadh. When I moved to the US, it was for similar reasons – cultural freedom, economic opportunity – the sort of scarce liberalism you could not find in the Middle East anymore. Especially after the fall of the Shah, the Lebanese Civil War, and the post-WWII era which saw a combination of colonialism, religious extremism, sectarianism and political primitiveness in the form of authoritarianism – hopes for freedom of any kind were wishful thinking. Now, I’m 28, searching to establish my footing in America – specifically here in Orlando, FL. Though I know I belong in New York, or LA. I need to be there now. I wish to act too, and direct – put this novel[s] of mine into action. I have come across obstacles here too though, in America. They have been social and economic, since in the free world, democracy limits conflict between civilians – at least to a certain degree relative to non-democracies, where law and order are swept under a dirty rug of lies blood and slander. What I mean is, democracy means we compete without violence – but that doesn’t guarantee justice. Unfortunately nothing or no one can – but God. Trusting any man or group of men with too much power is dangerous though. In the West, struggles are social – against conformity and pressure, and financial coercion [socio-economic]; whereas in the East coercion is more socio-political. But I was born to be free. Like all humans. Only, I knew, that unlike all humans I must somehow gain the courage, by God, to rise above the average, and fulfill my individual destiny, completely, and wholly. I pray each human can accomplish it, but bearing such a burden is not my responsibility. In fact that has precisely slowed me down. Because people know what I am capable of, and instead of allowing it to flourish completely, they wish to allow it only flourish subtly which I cannot afford because that is not my destiny. I know that. I have always believed it, but they have tried to convince me otherwise. The so-called “THEY” does it – as DJ Khaled calls it. I cannot flourish economically or artistically or morally if I am not to be myself fully and that person is not who my so-called partners but actual competitors do not understand. I do not care anymore. I must flourish. I understand that freedom also means people fail – but I believe in my destiny. It is true, that might either believe it blindly, not possess any talent and so forth – but in my case I don’t think this is so. That is my conviction. I do believe that existence and being is perfect and that destiny triumphs in the end. That being said, I must present particular products and sell them as they are intended, eternally. That could not be done anywhere but in the freest of the all nations – America. But even here, I have also encountered political distress, mainly because, after 9/11 the immigration process disenfranchised people like me living inside the US, and people outside. The truth is I am now realizing what it means to be an American citizen, while still being so distant from that reality. It’s like a ship sailing away from the statue of liberty, but always remaining close enough so that the passengers onboard can still see it. That is the metaphor of my position. And even then, I have still striven. I have been persistent and ambitious. In the face of my social dilemmas, and competitors, who, through peer pressure, seek to stifle my growth and potential. I have striven in the face of inhumane institutionalized delays and political injustices. I am the child of immense political injustices [Armenian Genocide; Syrian Crisis], a history stained with much betrayal [Autocracy; Zare; Courage]. I was denied financial aid of all sorts, scholarships, grants, basic public aid – due to my immigrant status. I thank God for all these feats despite the setbacks, as He makes it all possible. I currently create music as Danny K, my brand, despite many struggles against my competitors as well as with the industry itself. Furthermore, I am enrolled as an MA student at UCF – studying political science, which I hope to utilize in the future in diplomacy, research, writing and teaching. But the story of my life is of two portions, past and future. And the future is upon which legacies are made. The legacy of mine and my family and our Creator shall triumph. Though troubling, our past has led us to this fine point of no return. It is time to uncover my personal legend fully. I have delayed it long enough, have I not? For my self and my family, I must do this. But most importantly, for God. Tim Kaine has been officially declared as Hillary Clinton’s vice presidential running mate. As news tabloids emblazon images of the newly chosen “veep” on television and computer screens, many ordinary Americans are left wondering – who is this guy? It is a fair question, since for most Americans, Tim Kaine is a stranger and a new face in politics. Similarly, in 2008 many Americans found themselves asking the same question about presidential nominee Barrack Obama. But this is a much different scenario. Still we are left asking, who really is Tim Kaine and what will he bring to the table, if anything? As Donald Trump’s campaign continues to dominate the headlines, ordinary Americans are left wondering what is left for Hillary to do. Does she have a chance? Tim Kaine first rose to national prominence when he was purported to be then presidential candidate Barrack Obama’s VP running mate in 2008. Since then, he has been largely out of the national political discussion, that is until now. But some characteristics of Tim Kaine give reason to believe that he is someone to pay close attention to. Kaine born in Minnesota but raised in Kansas City, Missouri. He is of humble beginnings as his father was a welder and was raised Catholic. He received his BA from the University of Missouri Kaine and attended Harvard Law School afterwards. During his tenure at Harvard, Kaine embarked on as a missionary with the Jesuits in Honduras. There he learned to speak Spanish fluently. He has on occasion delivered his speeches to Congress in Spanish. In fact, in 2013, Kaine delivered a speech introducing the bipartisan immigration bill drafted by the “Gang of Eight” entirely in Spanish – an unprecedented feat. Kaine’s political career only began in 1994, therefor Americans are right to be more than inquisitive about their potential vice president, especially given heightened level of polarization between the two candidates and their parties. He political career took off in Richmond, Virginia where he started working for the City Council. In 1998 Kaine was elected Richmond’s Mayor and in 2005 he became the state’s Governor. From 2006-2011 Kaine served as the Democratic National Committee’s Chair and in 2012 he was elected Senator of Virginia defeating sitting governor George Allen. It appears Kaine’s ambitions were carefully coordinated and executed. This might be underscored by the fact that Kaine has never lost a single election. Scared yet, GOP? Still, Kaine does not maintain an impressive feat of policy. He is on neither extreme end of the political spectrum, though it might be appropriate to classify him as center-left, but certainly gravitating towards the center. As Governor, Kaine passed massive budget cuts amounting to nearly five billion dollars, which was quite unpopular in his state. With regard to his political positions, he has generally taken center-left positions, recognizing LGBT rights, climate change and the need for universal healthcare, to name a few. But his budget-cuts, promotion of international free trade and his support of American military operations in Afghanistan are indicative of his centrist affinities too, which makes all the more sense why he would be Clinton’s ideal running mate. His foreign policy experience is limited, and thus enables little analysis. One particular controversy which occurred with his staffer, Esam Omeish, a Libyan-American doctor, who was appointed to the Virginia Commission on Immigration in 2009. Mr. Omeish expressed criticism for George W. Bush & the Israeli Lobby’s influence on US politics, leading to his resignation. Albeit Tim Kaine is certainly apt for the job. His experiences and mobilization through the ranks of Virginian politics is evidence of that. But will Kaine be the necessary ingredient to Clinton’s recipe for defeating Donald Trump? Time will tell – on November 8th, 2016 to be exact. The Rebalancing of Powers: From ‘Brexit’ to Babel? There is a disconnect between national policy and international relations. The decision to leave the EU by the UK, or “Brexit”, is a symbol of that disconnect. But in order to understand the origins of this decision, it is important to highlight the UK’s tradition of reluctance and hesitation towards the EU since its inception. By nature, the UK, like America, prefers to play a conservative role in international affairs, dabbling in just enough to get the benefit, but not enough to bear the burden. But the armed crises in the Middle East have created a storm in UK & EU politics, with the migration crisis being the crux of the problem. Evidently, the UK prefers to leave such matters in the hands of its European counterparts, which is ironic because the UK is America’s closest ally in Europe – both countries are directly responsible for destabilizing the Middle East in the first place, under the premise of liberalization. This is where the disconnect begins. At least half of the UK truly feels undermined by the concentration of power, underrepresented and almost collectivized by being part of the EU. But is the decision to leave the EU a right-wing populist scheme exploiting frustrations of the ordinary Brit? In South America, both right and left wing populism have failed to their more centered opponents. The US is still determining its fate. Has this decision created a more or less secure world? Is this decision likely to produce positive or negative results in the UK’s social, economic and political fabric? How will this impact the rest of Europe? What will happen to the migrants? It is in fact the people who have decided, through referendum, to leave the EU. Despite a targeted and well-developed “leave” campaign, the decision is also inspired by general discontent towards the EU in Britain. But the facts and rhetoric surrounding the campaign reveals “Brexit” is more about xenophobia & Islamophobia than it is about sovereignty. The majority of those who voted to leave the EU were above the age of 40. The vast majority of those who voted against were in their 20s ad 30s. Given that London just elected its first Muslim mayor, there is reason to believe that unfounded, prejudiced paranoias about migrants and Muslims have stoked fears and insecurities in society, just enough to feed into the allure of right-wing populism and fear. UK MP Nigel Farage proclaimed victory, ushering the 23rd as the UK’s modern independence day. He went on to claim that such a victory was achieved without any blood spilled. But only last week, British MP Jo Cox was violently murdered by a right-wing extremist who shouted “Britain First” as he committed the murder. Has this been understated by the media? Compared to reporting on terrorism linked to one or more Muslims, it is difficult to say that the media is not biased. Notable international relations theorist John Mearsheimer predicted the disintegration of the EU as a result of the current international political dynamic which has seen America as the world’s sole superpower since the dissolution of the USSR. That dissolution has almost removed the security incentive for unity, or balancing that brought the EU together in the first place. There appears to be a growing rift among NATO members, particularly between European states and the US on how to manage international affairs. The differences stem from foreign policy on the Middle East primarily. Is the UK’s decision to leave the EU an inching towards or away from subservience to US leadership? That depends on the direction US democracy goes. If the American people also give in to fear, Donald Trump might be the next US president. This suggests that the two of the world’s most influential powers, the UK and America, are juggling between the past and the future – traditions of colonialism, racism & global mischief – and the equally traditional struggle against those forces, political enfranchisement, and socio-economic equality. Europe is drifting towards a center-left progressive “utopia” – something despised by the British traditional-mentality. The same could be said of the US. This is vindicated by the statistics surrounding the ‘Brexit’ vote which saw the majority of the “leave” supporters being over the age of 40. Without delving deeply into history books, the average person might not know that much of the US’ post-WWI behavior was determined by the British, by prompting fear and insecurity about illusory global threats. In 1952, it was the British who convinced the US that movements for sovereignty in the Middle East were a threat. Initially the US had actually empathized with the struggles for independence in the Middle East. The UK convinced the US to overthrow a democratically elected leader in Iran, and the US agreed because of the paranoias injected by the UK about the so-called “communist menace”. To some it may be surprising that racism, Islamophobia and fascism are creeping into US and UK politics. To others, perhaps more victimized by these forces, it is more dangerous than surprising. If the US decides to follow suit and elects Donald Trump, there is reason to believe that global tensions might intensify. Remember that European history is bloody. Wars between France, England, Germany were commonplace. The UK’s exit from the EU might disturb this legacy of peace and harmony in Europe which has endured since WWII. Furthermore, it might reintroduce fascism into the West – long thought gone and dead. It isn’t hard to imagine what would happen if the US did in fact follow suit. Two blocs would eventually form in the global order – a rebalancing of powers if you will. The UK and the US would be together on one side; Russia, China & Iran on the other. India would likely play an indirect role, but ultimately throwing most of its support behind the latter bloc. The contrary would apply to the Gulf states in the Middle East, Israel and Pakistan, who would likely remain under the auspices of the UK & the US. Altogether this can be described as the modern world order. In this scenario, the EU disintegrates completely. The fault line will likely split between France & Germany – to no surprise, with much of eastern Europe balancing against the UK & the US. The war between fascism and collectivism ensues. The ideologies of capitalism and culture are at war – they are mutually exclusive. In reality, capitalism fully realized is fascist, and collectivism fully realized is communist – both authoritarian to some extent. But the latter is conditional and retaliatory. In a perfect world, neither would exist, and universal democracy could flourish without capitalism and communism. Till then, we must pick sides and lesser evils or resort to anarchism. There is still hope for the world and America. Clinton is not our salvation – but in politics there are no angels; only lesser devils – or so it seems.